Looking to Find more Freedom in your Business? In the US we celebrate our Independence on the 4th of July! 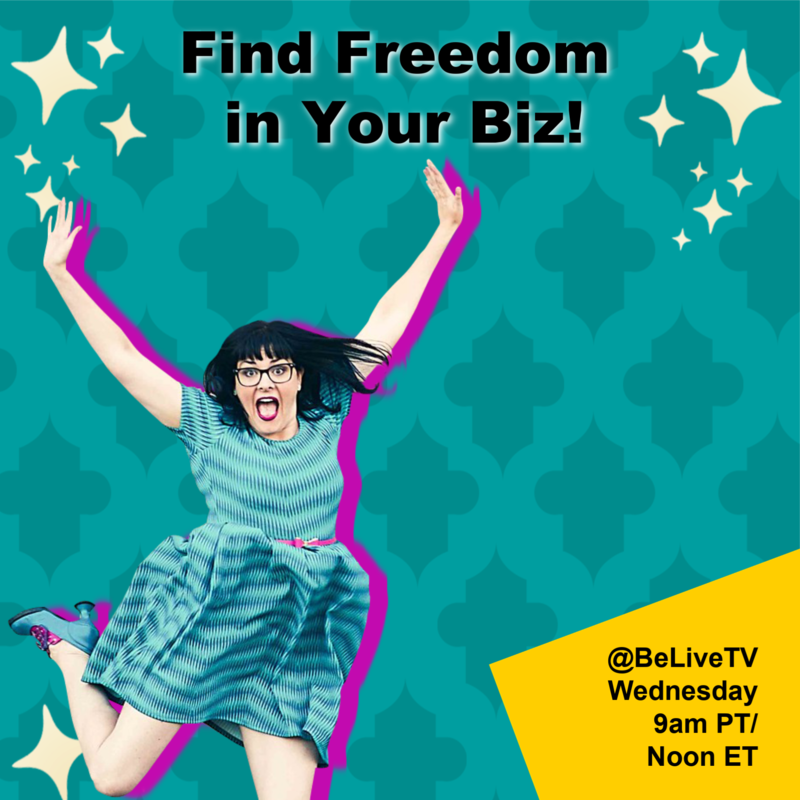 In honor of FREEDOM I'm going to share with you How to Find More FREEDOM in your business! Most of us start our businesses because we are looking to make a difference, doing what we love, in a way that allows us to set our own schedule and live a lifestyle of our choosing. Buuuuut… we are often smacked in the face with the workload and the schedule we have to keep up to grow or maintain the growth. So, let's shake that up! We want you to make magic in the world, and do it in a way that allows you the flexibility to do so on your own terms! Can't wait to share these strategies with you! Independence Day in the US is all about FREEDOM!! For many of us, the reason we started our business is that we want to create more freedom in our lives. Freedom of our time of choice and the ability to do what we want when we want. Another challenge: Boundaries! When you love what you do… it is hard to set the boundaries that create the space for the freedom we desire and space to grow into your dreams. So to combat that it is important to have the right mindset to get the freedom in your business you want. If you want the freedom in your business and that space to grow… it is not going to happen if you don't have the right mindset. Why? Without the right mindset you are going to talk yourself into the position you were in before! There is lots of talk about having a positive mindset. It’s not just talk because a negative mindset can be like a dragon or gremlin. That dragon keeps showing up but… it may wear a different mask… so keep an eye for this robbing you of freedom in your business. A song in The Big Fish called “Fight the Dragon’s” comes to mind. When the Dragons show up… just acknowledge them, say thank you, and then send them on their way and move on! Cheryl says: “… mindfulness, awareness and choice… we choose to be happy… it is a Choice! !” YES!! It is a piece of jewelry. It is a symbol with every letter of the alphabet in it. So it can represent any word you want to focus on each day. I wear it every day and sometimes more than one! I give each an intention because it is not easy to stay committed to this open mind of possibility. When a dragon shows up imagine it is just a bubble. Then take your feather out and just pop it!! Then, come back to what actually matters. After you commit to the mindset piece… and you make the decision that you are committing to a life of freedom… you have to determine what that looks like for you. You have to set your vision. And not only set your vision… but have the courage to stay the course and follow it. Especially when the Dragons show up!! If you are not clear about your vision other things are going to take over. You will go back to old habits and the freedom you want in your business is going to get lost. My coach Felicia has a great meditation for this over on her website. Get really clear about what it is that you want. Then literally tap into… what.would.I.love? Often what you want is sitting right in front of your face, but you don't recognize that it is there. I wanted to exercise more. I wanted to go for walks to a coffee shop like I did when I lived in New York. I wanted to have Starbucks more frequently (Espresso does not give me heartburn so I drink Starbucks coffee often). The solution: There was a Starbucks that was a 30-minute walk from my house. All I had to do was get the kids to school a bit earlier and go for my walk to Starbucks. Are you kidding me! Perfect solution: exercise, a walk to a coffee shop, and Starbucks all in one! Be open and flexible on the path to get there. Sometimes we get fixed on a path or direction to accomplish a goal… does that really serve you? Often times it does not. Bring your uniqueness, your personality, creativity, and resourcefulness to discover the path. The secret ingredient in your life is YOU!! I bring my crazy, cheerful, and fun personality to my life and it is authentic for me. If and when I stop doing that… it is not good. If you stop asking yourself that key question: “What would I love?”… you will find your freedom gets crushed… and that is not good. Stay clear and committed to what you want and what you love. In order to get to the place where you are being really productive and accomplishing your goals… you have to set aside the time to do the work. Prep-work beforehand. The time to actually do it. Then the time to properly follow up and make adjustments or re-work things. Here are three time-tips. Keys to manage time better. i. What can I delete? Look at your calendar and ask the question… “What can I delete?” Also, stay true to what you love and let that guide what you can easily delete from your calendar. Be a time Traveller and live in the future. Create your future now! Here is a sneaky way to live in the future. If you can't find the time in your calendar… use this great tip from my friend Diane Hoffman. She says to look 3 weeks ahead where you do have space and time available and block in your time there. The point: Live in the future! With your calendar live as if the time you want is already there. Book it in your calendar even if you have to move forward a few weeks! Make it happen! A book by Gay Hendricks called “The Big Leap” has an entire chapter on time called “Einstein Time.” The concept is that we all have the ability the compress or expand time. For example, why is it the same 2 seconds can seem like forever or just a snap. Time will slow down and seem like forever if your hand is on a hot stove. Milliseconds will seem like forever. Contrast that with time that seems like a snap. Seeing loved ones off at the airport, perhaps you have a son or daughter leaving for service and you don't know when you will see them again. That last hug seems like a snap and you don't want it to end but it was just too short. Think Einstein time in your business. Tap into what you love and set boundaries to them. Our next section talks about boundaries. When negative things happen you have a choice to make… continue in the negative or… choose to look for or create positive outcomes. To do this you have to know where your boundaries lie. Make these choices out of love. Setting boundaries is not selfish… it is a freeing and living into possibility. It is a wonderful thing. Reframe boundaries into freedom and possibility. That it is the most giving and wonderful thing you can do for yourself and for others. Leanne DiSanto says: “No.” is a complete sentence! Love this. Let that sink in. Choose discomfort… over resentment. If you really want freedom in your business… it is better the choose discomfort communicating your boundaries in the short term… rather than resentment in the long run for things unspoken on your's or other people's parts. Like if you don't say no to something… then resent having to do it. Or you say yes to something that your heart is not into and others are resenting you for a half-hearted effort. Neither of these are good. If you commit, you need to stick to what you promised yourself. Commit to the course of action… and at the same time be open to the freedom that is possible on the journey. You can reach a level of success but still not have freedom in your business if you do not stick to your commitments. When you commit to freedom you have to make choices. Apply all these things and you will create freedom in your business. There you have it. Thes are 5 amazing ways you can create more freedom in your business: Mindset, Vision, Einstein Time, Boundaries, and Commit. Would you like to get more support with ManyChat and Messenger Automation? Click here. Want to get your messenger automation basics built for you! Quick, easy and hassle free! Click here. Big thanks to my friend Tom Birchall (fb.me/TomBirchallBizPage) who helped to write up these awesome show notes!